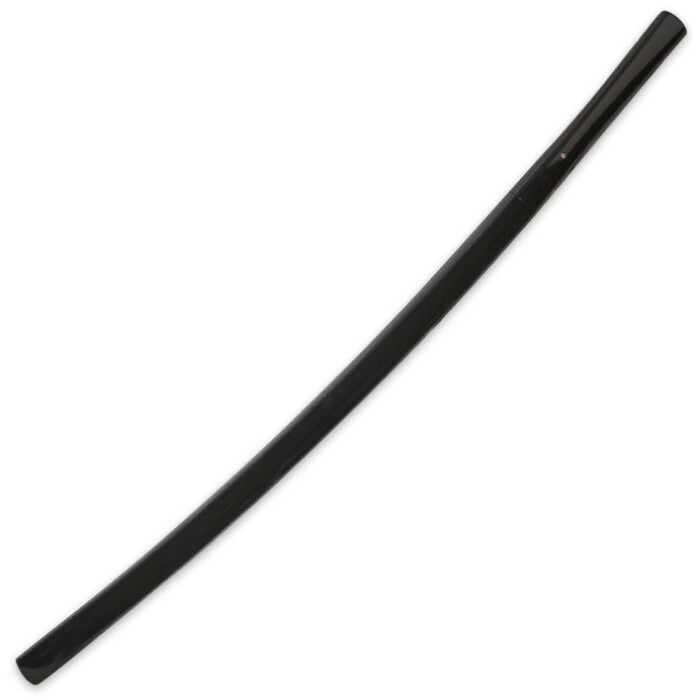 This sword embodies traditional Shirasaya style and grace in a modern day production. We put our focus on producing an unbelievably low priced yet fully functional Shirasaya, with emphasis placed on a razor sharp blade direct from the factory. Hardwood construction from end-to-end with high gloss black finish, just looks brilliant in person! The blade is secured with traditional means and can be removed for care or display. The blade is tempered and you will not see a machined cutting edge. Typical retail on a product like this is $99-to-$129 and we expect to sell out of this model quickly. Includes free black cotton sword carry and storage bag. The sword I have is decent blade is sharp have only one complain't the one peg that holds it together is so loose you can pull it out with your finger if you shake it it will fall out and I don't know where to find a new one its a way smaller peg then my other swords so yea a Lil disappointed it is sharp though ! 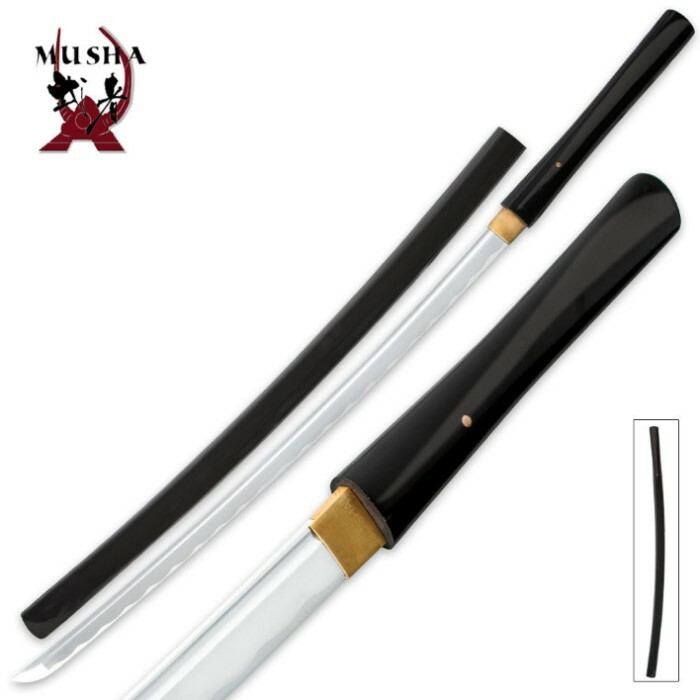 5 star rating, This is a very well made sword, very sturdy, and very sharp, I was able to shave some arm hairs with it so be careful it will cut you, definately not a toy, I would recomend this to anyone who wants a quality sword. Im now a fan of Musha and will watch for other Musha swords. Notes: When first getting it, the sword will be a little difficult unsheathing. Perfect for the price! Looks just like the picture. only complaint would be that the blade says china on the side. But good for the price. I used to collect cheap swords all the time just to display and had 1 real sword that I practiced with allot. I wanted to start collecting again and have looked at this site allot. I wanted a simple battle ready sword and chose this one. It was a perfect choice. It got to me in one day. It is very sharp and well balanced. The blade was straight as an arrow. I am extremely pleased with this weapon. Don't let the price fool you. This is a high quality sword. Hmm, where can I start with this? First off, I've bought the rosewood version of this sword when I first joined this site and it was a very beautiful sword. The metal had a nice shine to it along with a very balanced polished look to it. That sword also came super sharp, sharp enough to at least cut through a couple of bodies for an old fashioned cutting test (mind you, that's if it was the old age of samurai). Now then, for this one that I just recently bought. I was hoping for a flat black like in the picture, but got a fully lacquered sword instead like other reviewers have said. I have tested the sharpness of it, but after running a finger across it a little, I can say it isn't sharp. And after closer inspection, the tip of of the edge is bent, not the pointy part mind you, but the actual edge around the area of the tip.